“Overall, the crime, drug usage, and violence I witnessed growing up were the motivating factors that allowed me to overcome my childhood challenges,” Wellwerts said. As a kid, he heard his great grandfather talk about joining the military during World War II only to be discharged because he had lied about his age. He was too young. His great grandfather eventually joined the Marine Corps following the war. So, Wellwerts set his sights on military service out of high school. Like his great grandfather, he became a Marine. Wellwerts rose to the rank of Sergeant in the U.S. Marine Corps. He learned the best way to lead was by his own actions and his own resolve. With limited resources, he ensured his battalion’s readiness in Afghanistan as the 1st Battalion, 7th Marine Regiment helped with the withdrawal of U.S. military forces in 2014. He was awarded the Navy and Marine Corps Achievement Medal for his work. But for the Phoenix native, the script wasn’t complete. It was simply switching scenes. Wellwerts married his high school sweetheart, Sandra, whom he met at Apollo High School. When he was discharged from the Marines in 2015, they moved back to Phoenix. She began to teach high school math in Glendale. He enrolled in Glendale Community College. 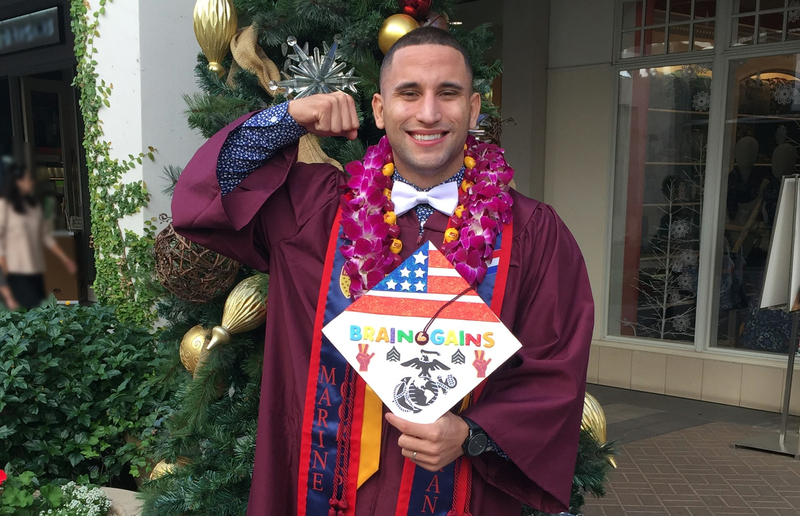 The aptitude he showed toward military service helped him excel as a college student. But it wasn’t easy. Sandra and Philip Wellwerts at a Marine Corps Ball. Sandra earned her Bachelor's degree in Computational Mathematical Sciences from the ASU College of Liberal Arts and Sciences in 2013 and her Master's in Secondary Education from Grand Canyon University in 2015. Philip earned two degrees in December 2018: a Bachelor of Science in Criminology and Criminal Justice and a Bachelor of Science in Public Service and Public Policy. He soon transferred to the the School of Criminology and Criminal Justice at the ASU West campus in Glendale. It was there that adviser Karla Moreno-Arias suggested the first-generation student seek a second degree. Moreno-Arias pointed out that his GI Bill would pay for two majors if they were taken at the same time. “I sent him an e-mail to congratulate him on his success and he responded with ‘hey, if you wouldn't have told me that it was possible, I wouldn't have done it,’” Moreno-Arias said. Wellwerts dedication paid off. He is the fall 2018 outstanding graduate of the School of Criminology and Criminal Justice. He graduates with a second degree in public service and public policy with an emphasis in business from the School of Public Affairs. Both schools are in the Watts College of Public Service and Community Solutions in downtown Phoenix. And both are top ten rated schools in the nation based on US News & World Report rankings. “It was pretty difficult going from a criminology and criminal justice class to a public affairs class because you were looking at society from a different lens, but I would say they both balance each other out very well,” Wellwerts said. During the fall 2018 semester, Wellwerts interned with the Phoenix Fire Department's Community Assistance Program or CAP. As a CAP team member, he provided on-scene crisis intervention and victim assistance services throughout Phoenix. His own situation growing up continues to guide his future. The dual-degree graduate plans to go back to school in a couple years to earn an MBA from ASU’s W.P. Carey School of Business. It also helped that his commanding officer in the Marine Corps highly encouraged Wellwerts to get a business degree. “He would often say that, “Everything is business,” Wellwerts recalled. First, the former Marine hopes to get hired on with the Phoenix Police Department. Ultimately, Wellwerts would like to work in narcotics. He knows his life experience and education can make a difference. Researchers at Arizona State University have been selected to receive $3.1 million from the U.S. Department of Energy’s Advanced Research Projects Agency-Energy to develop learning-ready models and control tools that will revolutionize electric distribution system operations. Last month, the Department of Energy allocated $98 million for 40 new projects to develop transformative technologies for the nation’s energy system as part of ARPA-E’s latest funding opportunity, OPEN 2018. OPEN solicitations are an open call to scientists and engineers for technologies that span the entire scope of ARPA-E’s energy mission. With the fourth-highest OPEN 2018 award among those given to academic intuitions, the ASU team will focus on maintaining distribution system reliability and efficiency while accommodating high penetration of distributed energy resources. Common examples of these resources include rooftop solar panels, batteries (for energy storage) and electric vehicles. Ira A. Fulton Chair Professor Vijay Vittal will serve as the project lead with support from Professor Raja Ayyanar and Assistant Professors Anamitra Pal, Mojdeh Hedman and Yang Weng in the School of Electrical, Computer and Energy Engineering, one of the six Fulton Schools. Although distribution systems have been around for more than a century, the real-time operation of the systems have not been significantly automated, Pal said. But the increasing penetration of distributed energy resources and transitioning of consumers into prosumers — meaning producers and consumers — and prostumers, or prosumers with storage capability, is challenging current distribution system operations. To overcome such challenges, the project will focus on designing and developing sensor-rich and learning-ready distribution system models for dispatchable resources, loads and state estimation. The advancements come with many benefits for the power system and its participants, such as more affordable electricity, reduced network costs and improved reliability. The proposed work originates with the development of computationally efficient and accurate topology processing algorithms, including error-correction capability as well as load and distributed energy resources models for reliable system planning and operation. The team will extract knowledge from the data produced by the sensors to develop an advanced distribution system state estimator that accounts for key features such as multi-phase, unbalance, distributed loading while incorporating necessary functionalities such as bad data detection and correction. The team’s integrated approach to real-time management will allow for the adoption of distributed technology, such as photovoltaics and electric vehicles, Pal said. By harnessing and leveraging the capabilities of distributed energy resources, this approach will also enhance distribution system monitoring, observability, control and reliability. ASU researchers will work closely with the industrial energy consulting and services company Nexant Inc. and APS — Arizona Public Service Company, the state’s largest electric utility — to advance cutting-edge topology processing algorithms and produce prototype-level software tools to prepare these emerging technologies for industry adoption. 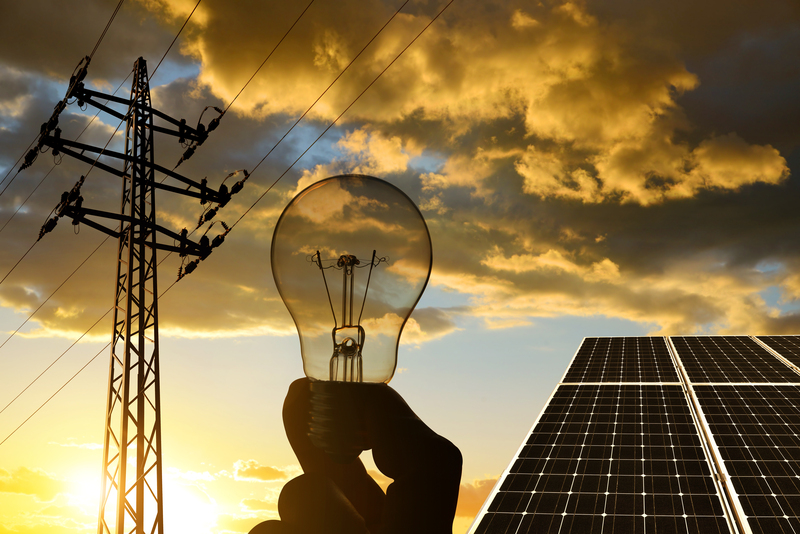 “By integrating more distributed energy resources in a distribution grid, the local grid will be sustainable and resilient, increasing the nation’s energy independence and security,” Pal said.